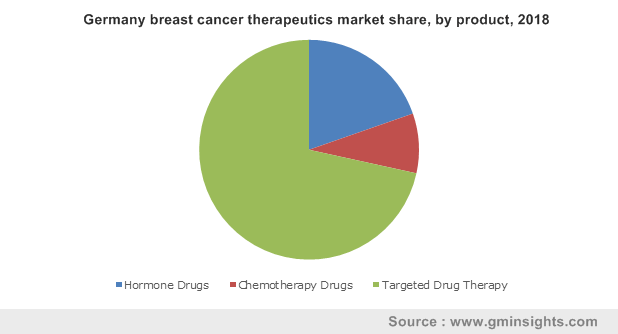 Breast Cancer Therapeutics Market size was valued over USD 16,228.2 million in 2018 and is expected to witness 9.5% CAGR from 2019 to 2025. Rising prevalence of breast cancer pertaining to factors such as prolonged exposure to endogenous oestrogens, early menarche, late age at first childbirth and late menopause will be a high impact rendering factor for the industry growth. Increasing technological advances in cancer biology and launch of several diagnostic and screening programs worldwide should drive the business size. Growing adoption of therapeutics owing to factors such as blocking estrogenic from binding to tumour cells, risk of distant reappearance, lowering jeopardy of reappearance in the breast that had tumour and reducing risk of developing disease in another breast will propel the industry growth. Growing awareness regarding breast cancer, rising shift towards adoption of western lifestyle, short breast-feeding timeframe and rising prevalence of obesity in women after menopause will drive the industry size. Increasing rate of alcohol consumption in women, rising use of hormone replacement therapy (HRT) and oral birth control pills resulting in increased levels of oestrogen will boost the business size over the forecast period. Growing exposure to certain carcinogens and endocrine disruptors, for example in the workplace, working night shifts results in increased risk are surging up the global market. Prohibitive cost associated with the use of breast cancer therapeutics may hamper the industry growth. Increasing cost of early and late stage disease therapy, continuing care on a per-unit time basis, accounting for the major share of lifetime cost owing to relatively extended survival of breast cancer patients may further restrain the business growth. Targeted drug therapy market accounted for largest market share in 2018 and was valued around USD 11,559.6 million. It is forecast to witness substantial growth over the coming years owing to associated factors such as targeting certain parts of tumour cells that allow the tumour cells to grow faster and abnormally, resulting in turn off or blockage of chemical signals. Furthermore, features such as stopping growth of new blood vessels, changing proteins, triggering immune system, and carrying toxins to the tumour cells to kill cells will drive the therapy demand over forecast years. 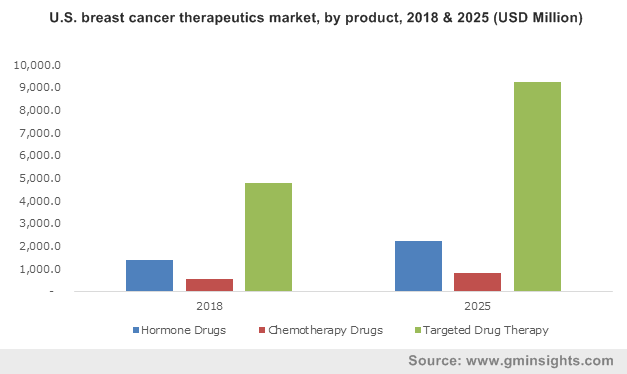 Chemotherapy drug segment is set to witness a considerable growth at 6.6%, due to factors such as attacking all cells that are growing quickly and inflated cost associated with the drugs resulting in financial burden. Moreover, undesirable chemotherapy reactions and establishment of resistance to drugs resulting in multi-drug resistance are the major restraining factor in chemotherapy usage. Retail pharmacies held the largest market share in 2018 and was valued around USD 6,336.9 million. It will continue to be the biggest distribution channel for the industry over the forecast period. Growing shift from specialty to retail pharmacies owing to reimbursement variations and prolonged usage of oral formulations, particularly for targeted drug therapies will drive the business growth. Moreover, growing number of retail store and augmented investment in retail stores by retail giants in developing as well as developed economies will further boost the industry share. Hospitals segment will grow at 9.5% in the coming years pertaining to administration of drugs available in injectable forms in hospital settings which are reimbursed by patient’s medical benefits. U.S. market accounted for the highest regional share in 2018 and was valued around USD 6,698.3 million. The growth is attributed to growing prevalence of breast cancer and increasing R&D funding through public and private sectors. Growing elderly population, breast feeding discontinuation at an early stage and increased access to cancer care will stimulate industry growth. Moreover, rising demand for tumour therapeutics will strongly drive industry growth in the country. Germany dominated the European market with a market share of around 23% in the year 2018. 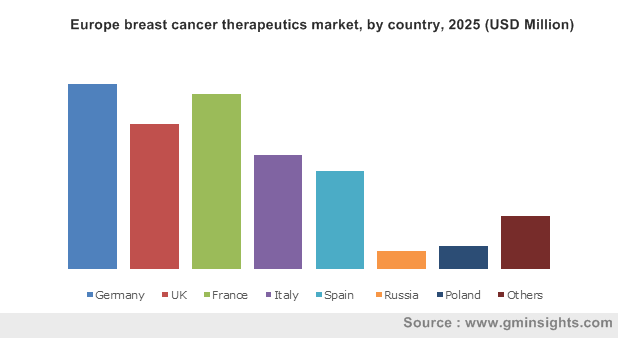 However, Poland breast cancer therapeutics market is estimated to grow with highest CAGR of above 10.4% in the coming years. Asia Pacific market will grow at 11.1% over the forecast period pertaining to increasing incidence of disease coupled with rising adoption of western lifestyle will fuel the business growth. Rising awareness of disease prevention, refining economic settings, and increasing adoption for technologically advanced products should drive regional business growth. Some of the major players in global market are AstraZeneca, Roche Diagnostics, Pfizer, Novartis, Eisai, Eli Lilly, Sanofi, and Celgene. Roche holds the largest market share owing to wide geographical presence and strong product portfolio. It is expected to dominate the industry revenue over the coming years. The company should face intense competition from other players such as AstraZeneca and Pfizer over the forecast years. 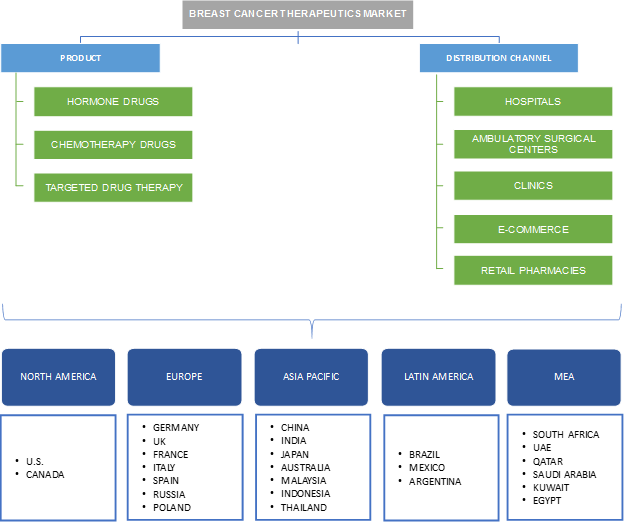 Breast cancer therapeutics industry is relatively competitive in nature due to broad range of pipeline products in clinical trial. Only a handful of firms offer therapeutics for breast tumour till date while others strive to introduce innovative drugs in the market over the near future. The breast cancer industry will witness a substantial expansion over next 7- 8 years. Increasing R&D investment by manufacturers for development of novel products, mergers and acquisition, increased CSR activities to spread awareness about the breast cancer will be high impact rendering factors. Some major industry players are trying to explore the lucrative markets by exploring other geographical regions.